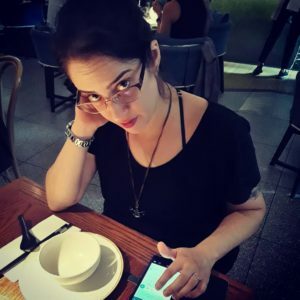 Rivqa Rafael writes short speculative fiction about queer women, Jewish women, cyborg futures, hope in dystopias, and any combination of these. In 2016, she won the Ditmar Award for Best New Talent, and in 2018 her short story “Trivalent” (Ecopunk, Ticonderoga Publications) was shortlisted for a Ditmar Award. Her short story “Two Somebodies Go Hunting” was published in the multiple award-winning anthology Defying Doomsday (Twelfth Planet Press) and was shortlisted for a Norma K. Hemming Award. As an editor, Rivqa has worked on academic journals and books, popular magazines, memoirs, and other publications, formerly in-house and currently freelance. She also edits fiction, including feminist robot anthology Mother of Invention (Twelfth Planet Press, 2018, co-edited with Tansy Rayner Roberts). Mother of Invention has been shortlisted for the Aurealis Award and the Ditmar Award, and is on the 2018 Locus Recommended Reading List. A strong advocate for writing communities, Rivqa has organised communal writing days and critique groups, and enjoys beta reading and mentorship relationships with other writers. She enjoys attending writing festivals and conventions, and live tweeting such events. She has twice judged science fiction short stories for the Aurealis Awards. In her writing and editing, Rivqa makes extensive use of her honours degree in microbiology and biotechnology and her master’s degree in professional writing. She also holds a graduate diploma in editing and publishing. Previous gigs include sub-editor and reviews editor for Cosmos magazine, assistant editor at the Medical Journal of Australia, and online zookeeper for musicians Tim Rogers and You Am I. Her full CV is available on LinkedIn. Rivqa is active on Twitter and Goodreads. Please use the contact form to request a quote for an editing or writing project.